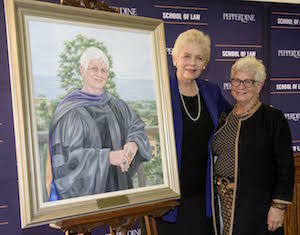 The Pepperdine University School of Law honored dean Deanell Reece Tacha with the unveiling of her official portrait on October 14. The event paid tribute to the Tacha legacy and featured comments from provost Rick Marrs, president Andrew K. Benton, and Tacha herself. President Benton gave a reflection on the Tacha legacy, and invited Marrs to lead a prayer over the guests in attendance. Following the opening remarks and prayer, Benton and Tacha unveiled the portrait, painted by artist Clydetta Fulmer. After the unveiling, Tacha addressed the crowd, specifically thanking Margaret Barfield and others for their generous contributions, her executive assistant Jennifer Champion for her steadfastness, her husband for his support, as well as all the students, staff, and faculty at the Law School. Ronald F. Phillips, School of Law senior vice chancellor, dean emeritus, and professor of law also expressed his gratitude for Tacha’s service to the University. The oil portrait is the work of artist Clydetta Fulmer of Montgomery, Alabama, who was also commissioned in 2004 to paint the portrait of former School of Law dean Richardson Lynn.